Last April was a big month for teams from The University of Texas at Arlington. 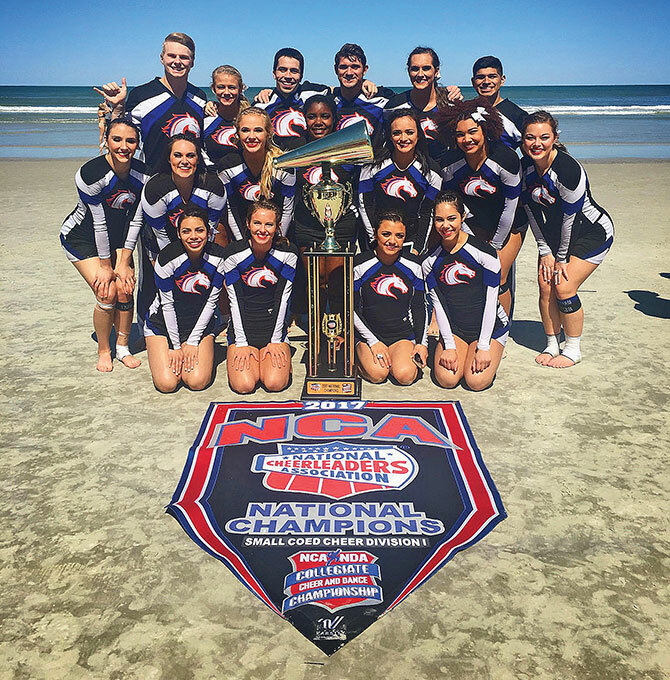 First, UTA's 17-member Maverick cheer squad took home top honors in the National Cheerleaders Association collegiate cheer competition. Then, a scrappy team of student gamers claimed first place in the Heroes of the Dorm National Championship on ESPN. The cheer squad's first-place recognition came in the Small Coed Cheer Division I category. The team was judged on its execution of stunts, pyramids, tumbling, and overall sharpness during two days of intense competition against groups from all over the United States. The honor marks the squad's fourth consecutive title and fifth since 2010. "This is the best team I've ever been on," says Morgan Rose, a sophomore nursing major and captain of the squad. "We have a great connection. I spend more time with them than my family, so they really are my family." UTA's Esports Club was completing its Heroes of the Dorm run at about the same time. The March Madness-style tournament featured 64 schools from across the United States and Canada playing Heroes of the Storm, a multiplayer online battle arena video game. UTA was 29-0 during the tournament, ultimately defeating Louisiana State University in the finals in Las Vegas. The grand prize was free tuition for each team member's remaining collegiate years.